In celebration of the National Children’s Month this November, Play It Forward and their partners – play champions – came up with different ways of participating in this week-long celebration. Happening from November 18 to 24, 2018, Play Advocacy Week is a campaign led by Play It Forward, Unilab Foundation’s therapeutic play program for children in vulnerable areas. The program is founded on the belief that every child has the right to play, and that play is essential in the mental health and holistic development of children. With more than 30 partners from the government, corporate companies, the academe, and the healthcare sector, Play It Forward wants to reach as many people as possible in order to make play happen. Play is essential in the mental health and holistic development of children. Children can and should play with a variety of toys: dolls, balls, stuffed animals, books. Even storytelling sessions can be full of play. PLAY with colors at the Color Run Hero Tour. This is best for: Everyone! Bring your friends or family in support of the youth of our country. I’m interested! How can I join? Visit runrio.com/race/the-color-run-hero-tour-2018 for details! Watch a local theater PLAY with your kids at PETA. What’s happening: Watch the Philippine Educational Theater Association (PETA)’s show, “Tagu-Taguan, Nasaan ang Buwan?” It is a children’s musical filled with quirky and imaginative sets and characters. This is best for: The whole family! I’m interested! How can I join? Visit their Facebook page at facebook.com/PETATHEATER for details on where you can purchase tickets. PETA Theater Center is located at #5 Eymard Drive, New Manila, Quezon City. PLAY with your imagination and make dolls with scraps, at Museo Pambata’s Doll Making Workshop. What’s happening: Museo Pambata is conducting a Doll-Making Workshop! This is best for: Kids, and adults too! If you are a mom, a teacher, a nurse, or if you simply want to learn another bonding activity with kids, then this is the place to go! More fun: A photo exhibit called “Through the Eyes of a Child”, as well as an art sale by kids, will also run in Museo Pambata from November 18 to 24. Unleash the power of Role-PLAY at KidZania. What’s happening: KidZania supports the National Children’s Month, and believes in the children’s right to play, right to learn and right to be. Let your child have fun while learning through KidZania’s role-play activities! When is this: Throughout the Play Advocacy Week, from November 18 to 24! This is best for: Children aged 7 to 17 years old, who want to learn how to be a doctor, a fireman, a reporter, and so much more! I’m interested! How can I join? Visit kidzania.com/en-ph for tickets! KidZania is located at Park Triangle, North 11th Avenue, Bonifacio Global City, Taguig City. PLAY in costume with Star Wars characters. What’s happening: Kythe Foundation, University of Santo Tomas 4C3 Eco, together with the 501st Legion Philippine Garrison, is bringing the Star Wars universe to life for the pediatric patients in the Philippine Orthopedic Center. This is exclusively for: Pediatric patients and their families at the Philippine Orthopedic Center, 78-A Maria Clara St, Santa Mesa Heights, Quezon City. I want to meet them too! Where can I find them? Check out their other events on their Facebook page at facebook.com/pinoy501st. Join the PLAY Sessions at Ronald McDonald’s Bahay Bulilit. What’s happening: Do you remember playing in a McDonald’s play place as a kid? 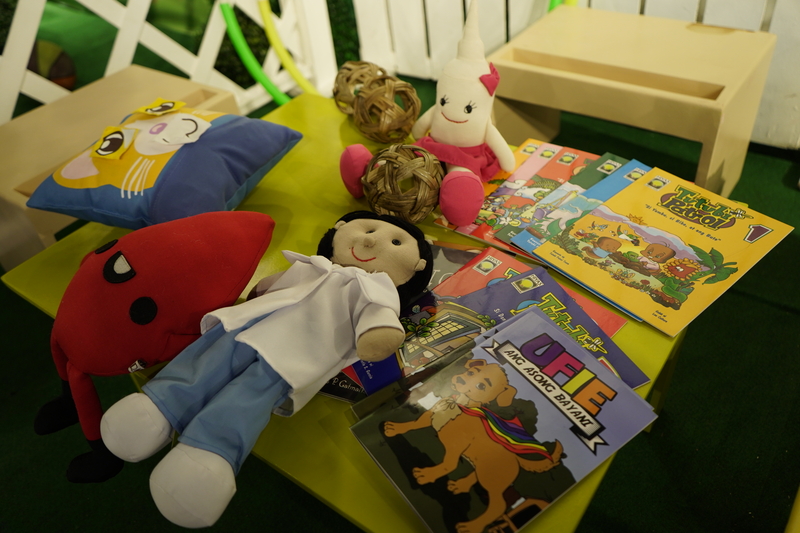 The Ronald McDonald House of Charities will be conducting play sessions in Bahay Bulilit play areas! I’m interested! How can I join? If you want to volunteer, please contact Danika Madulid at madulid@ph.mcd.com. Play champions from the Philippine Heart Center, WWF-Philippines, Bantay Bata 163 and Vico’s Artism will also be holding their own play activities during the week. Our friends from Philippine Pediatrics Society and A Child’s D.R.E.A.M. Foundation will be championing play through social media campaigns. Ayala Malls-Solenad will have giant art installations that feature traditional Filipino games. This is in line with Tukod Foundation’s Awit at Laro campaign, which celebrates the spirit of play. For a full list of activities during the Play Advocacy Week, follow http://www.facebook.com/PlayItForwardPH! Play is essential in the mental health and holistic development of children. Volunteers play with children at the kickoff of Play Advocacy Week 2018. Play It Forward has invited renowned artists to paint murals in the foundation’s key partner areas. 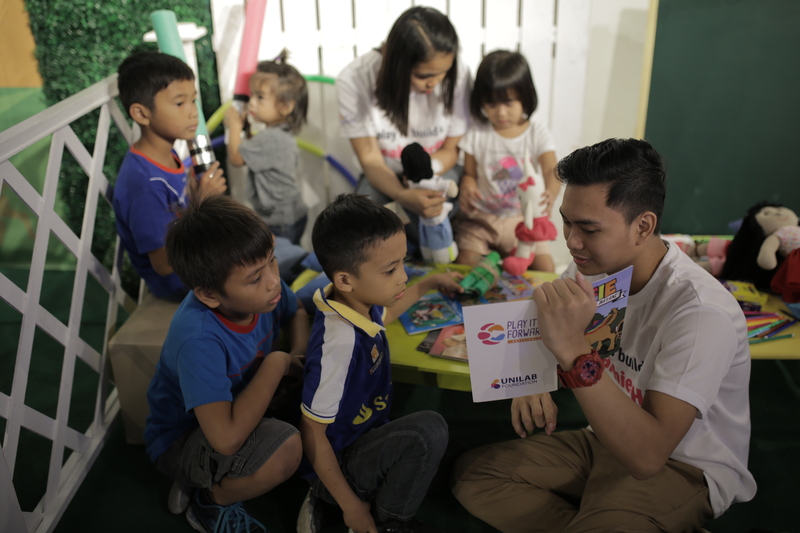 3D artist Archie Blanco will go to Play It Forward’s first ever play space in Cagayan De Oro, while Ged Alangui of the STOBOSA artwork in Baguio will visit the National Children’s Hospital in Quezon City. Together with volunteers from Gawad Kalinga and Play It Forward, these artists will bring a bit more color to the lives of the children in these communities. Play It Forward invites more Play Champions to help promote the children’s right to play. Since 2012, the program has been able to conduct over 3,000 play sessions, and has reached over 7,000 pediatric patients and children from vulnerable areas. The Play Advocacy Week is endorsed by the Council for the Welfare of Children. For partnerships and more information about the Play Advocacy Week, please contact the secretariat at (+632) 858-1000 local 8163 or email partnerships@unilabfoundation.org. You may also visit Play It Forward’s Facebook page and www.unilabfoundation.org. Council for the Welfare of Children, Department of Education, World Vision, Philippine Pediatric Society, Bantay Bata 163, The Mind Museum, Tukod Foundation, PhilAm Foundation, World Wide Fund for Nature- Philippines, Yes Pinoy, A Child’s Dream, Museo Pambata, Philippine Educational Theater Association, Operation Blessing, Ayala Malls Solenad, Kidzania, ComCo SouthEast Asia, Metrobank Purple Hearts Club, Ceelin Chewables, Enervon Syrup for Kids, Ferlin, Nutroplex, and Trisopure Baby Wash.
Cherubs Pediatric Massage Therapy Advocates, Fundlife International, Gawad Kalinga, Kythe, My Brave Little Warrior, MLAC, City Government of Cagayan de Oro, City Government of Malabon, City Government of Tacloban, City Government of Valenzuela, City Government of Valenzuela, Municipal Government of Del Carmen, Siargao, Brgy. Caridad Ibaba, Atimonan, Quezon, Lung Center of the Philippines, National Children’s Hospital, National Kidney and Transplant Institute, Philippine Heart Center, Capitol University Medical Center, Fe del Mundo Medical Center, Dr. Arturo Pingoy Medical Center, HealthServ Medical Center, Lariosa Clinic and Hospital, Metro Davao Medical & Research Center, Our Lady of Peace Hospital, Rizal Medical Center, Southern Philippines Medical Center, Tagaytay Medical Center, Tebow Cure Hospital, DepEd Bicol, DepEd Albay, DepEd Ilagan, DepEd Surigao, Ateneo Bulatao Center for Psychology Services, Far Eastern University – Nicanor Reyes Medical Foundation, Miriam College, Philippine School for Interior Design, UP College of Human Kinetics, Dalandanan Elementary School, Mañosa & Co, OMF Literature, Vico’s Artism, the Philippine Garrison of the 501st Legion, and Rotary International.